Remember how I said my favorite Valentine's Days were the ones I spent by myself? Well, karma listened, and I'm back at it again. Apart from having a single ladies celebration on Valentine's Day weekend (yes, wearing all black), I'm teaching yoga, drinking cocktails, dancing and treating myself. Below are some of the ways Camp and I are treating ourselves this month. Who knows, this could be our favorite Valentine's Day yet. Books and music: I started reading Aziz Ansari's Modern Romance post-breakup, and it's hysterical, honest and brilliant. I'm also listening to Father John Misty's newest album, I Love You Honeybear, on repeat. Beauty: I love Burt's Bees, and their newest chapsticks and lipsticks are to die for (I'm digging the dark shades for my moody little Valentine's Day). For my nails, I've been wearing Essie's Master Plan nonstop for the past few months (ironic as my life continues to shift and prove to me that master plans don't, in fact, exist). Mad Hippie also sent me some of their face serums to use, and I'm obsessed (both with the name and how vibrant they make my skin look and feel). I'm also waiting to pull the trigger on Dasein's unisex "Winter" perfume. And I couldn't forget Neutrogena. Nothing goes together like a cold night, stressful day and bubble bath, and their Rainbath products are still a favorite of mine. Home: I've been writing more and more lately, and AllSwell's notebook is my favorite way to do that - it's trendy and cute and fits nicely in my bedside drawer/work bag/purse/pretty much everywhere. 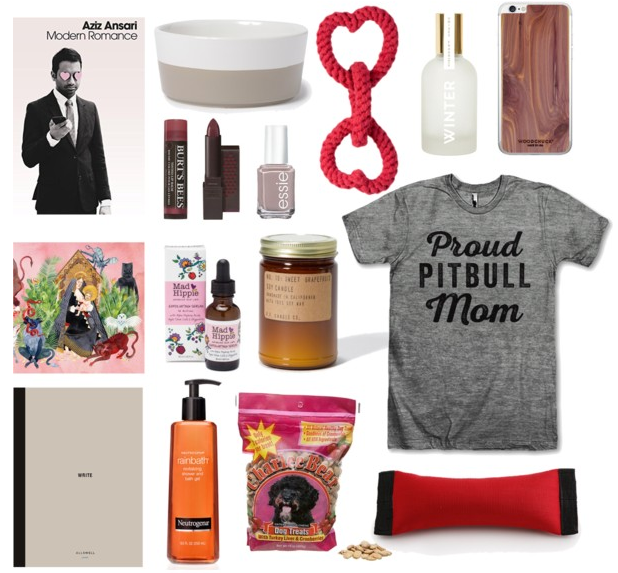 I'm also burning candles nonstop (obsessing over PF Candle Company's grapefruit candle), rocking a new wooden phone case (Woodchuck is a phenomenal local brand) and am debating buying or making that proud pitbull mom tank, because obviously. Pup: Don't worry, Camp's in on the love, too! Waggo sent him some super chic dog bowls that we can't get enough of, and his BarkBox is on the way, full of Valentine's themed toys and treats. If you're in Minneapolis on Valentine's Day weekend, First Ave has you covered. On Friday, they're hosting Forever Young Love Love Semi Formal (a semi-formal celebrating love songs from the TRL era), and on Sunday they're hosting The Love Below: R&B Dance Night. I can't think of a better place to be on Valentine's Day weekend.